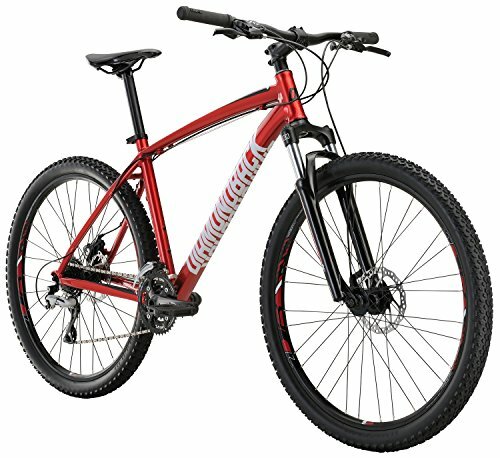 If mountain biking is calling you and you’re a beginner, you really want to look into the best entry level mountain bikes on the market. Good beginner mountain bikes have a number of common features. In this guide, we will be going over what you need to keep in mind when it comes to mountainbikes for beginners. Choosing the best bike goes beyond the design of the bike. You will definitely need a bike that is lightweight and has the ideal features for your riding styles. Choose a bike that meets your demands and also a bike that will serve you for a long time. It is hard to find a mountain bike for the entry-level category that combines style, durability, and quality the way the Overdrive 27.5″ does. At the base of all its features is a butted aluminum 6061-T6 frame that is sported on its high-end Pro version. The Tektro Aries mechanical disc brakes with 160mm rotors provide ample stopping power in any terrain. You also get a Shimano 3×8 speed drivetrain that comes with a Suntour XCT crankset. This gives you sufficient speed and power control whether on a downhill ride or up the inclines. The bike also features an SR Suntour XCT Coil spring fork 80 mm travel for more shock absorption in rough terrain adding more comfort. The SRAMx4 shifters ensure smooth progression and change of the gears. It also offers a much comfortable cockpit area allowing for long drives. The only setback is the performance of the preload dial adjustment of the forks which does not adjust accordingly. The wheels are also a bit heavy but provide an excellent all-round performance. It comes ready to ride saving you assembly process. The Diamond Overdrive 29 Hardtail Mountain Bike comes with all the loved features of a Diamondback bike topped up with large 29-inch wheels. Its outstanding features include. 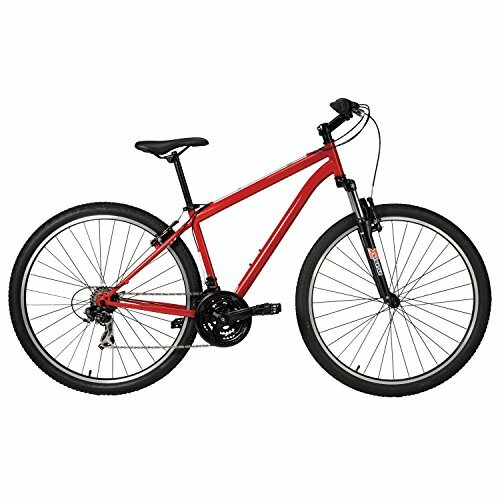 This is an excellent bike for beginners looking for experience in hardtail mountain biking or needs a bike to kick start their mountain biking experience. It offers great control and easy handling with the large wheels able to smoothly roll into bumpy terrains and large holes. It is very convenient for the taller riders while its machined head tube with the low height bracket make it comfortable when riding on both flat surfaces and inclines. The sturdy frame ensures you get durability without the usual weight effect of steel frames. The brakes are one of the best performing parts of this bike and they still offer room for adjustment to your desired result. The downside of this bike is largely the entry level bike fork, seat, and suspension. The seat gets uncomfortable after a long ride while the fork gets the job done but at great exertion. 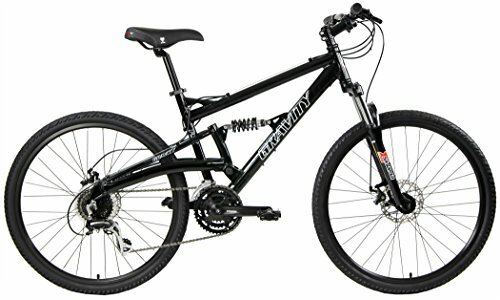 Gravity FSX 1.0 full suspension mountain bike is an inexpensive, agile and sturdy bike that lets you explore hidden trails without actually investing much. This does not in any way compromise on the features you get as there are some high-end aspects provided here. Here is an overview of this bikes specs; even at an entry level, the full dual suspension performs at almost competition level ensuring a smooth ride when handling anything outside extreme riding. The quality components guarantee long shelf life even with repeated usage. The use of an aluminum frame provides you with a lightweight bike that helps with handling and makes the bike multifunctional. You can use it for commuting as easy as for going on adventurous trails and cross country riding. The many numbers of gears ensure you are well served in terms of speed and power while the brakes perform reliably at different speeds. Other advantages include the smooth shifting action and easy assembly. There are a couple of shortcomings though. The lightweight nature means you will need to adjust suspension if you weight more than 220 pounds. It also lacks a kickstand and also has a short wheelbase. However, all these fade when compared to the value you are getting for the price. Several pros come with this bicycle especially for beginners starting out on the rough terrains. Its stable frame and powerful fork ensure you do not experience the shocks when riding through rocks and obstacles. The tires also offer excellent grip even on the loose trail. The huge mechanical brakes are smooth and accurate even on sudden brakes. While it has features that mark it as an entry level bike, it can be easily be upgraded over time to your ideal custom bike. The weakness of the bike lies in its heavy frame which is further compounded by the quite heavy wheels. The full suspension does not deliver on rough terrain, especially on the incline. Users have also had issues with the rear shock though everyone agrees, the bike is solid and durable. This is an excellent product that has been manufactured for the ultimate outdoor functionality and experience. The steel frame- which is available in red and black- is geometrically engineered to allow ease of riding. 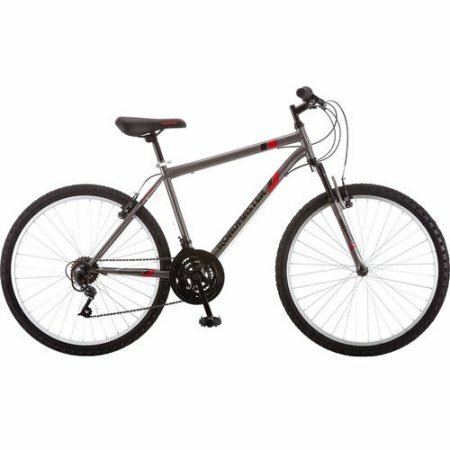 The Roadmaster is an ideal mountain bike that is right for use on rugged terrain or unpaved paths. The frame includes a suspension fork that absorbs all the shock from bumpy terrain while at the same time give you better control. Can also cruise on the streets. You will enjoy riding this bike out there. It offers an easy ride since it has a steel mountain frame angle. It has a suspension fork that softens bumps while riding and also increases the stability and control of the bike. It has 26″ wheels made of alloy rims which provide durability and makes the control easier. Tires are knobby which makes the bike handle all types of condition. This bike has three-piece mountain crank which will offer a wide gear range. It has linear pull brakes which will provide great stopping power. Gears of this bike are changed smoothly as it has SRAM drive twist shifters. The SRAM shifters allow you also to shift speed more efficiently and smoothly. Riding this bike will also keep you hydrated. This is attractive in quality and price. Has a frame that increases the stability of the bike and also its durability. 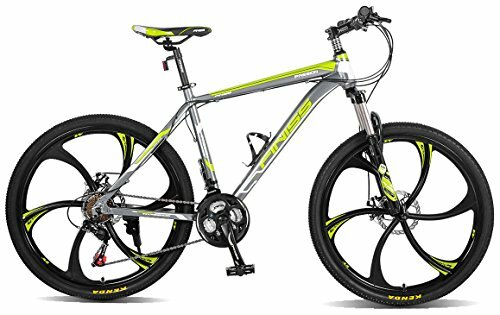 It a rigid mountain bike that is very comfortable to ride all the time Whether you are taking long road trips or just riding around the town, it is a perfect bike. You have assured of a smooth ride thanks to the suspension fork on the ergonomic easy to ride frame. The light but sturdy aluminum rims give the bike optimal performance and durability. It is a unique bike for both adult sexes. Frame material of this bike is made of steel which makes the bike durable. It has a mountain bike suspension fork that will smoothen your ride and also increase the stability of the bike. It also has shifters which increase the number of speeds up to 21. Its weight capacity is about 330 lbs thus making it light enough. Merax bike has dual disc brakes which will offer great stopping power while riding. Dual rim which is made of aluminum offers maximum performance and increased durability of the bike. It also has a steel kickstand. 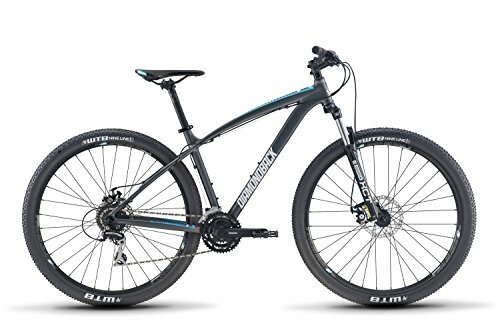 The Merax 26″ mountain bike is an easy assembly affair with exemplary features; more than you could expect in an entry level bicycle. Since the bike is not fully assembled on arrival, it comes with very clear instructions. This guides you on how you will assemble the bike more easily on your own. 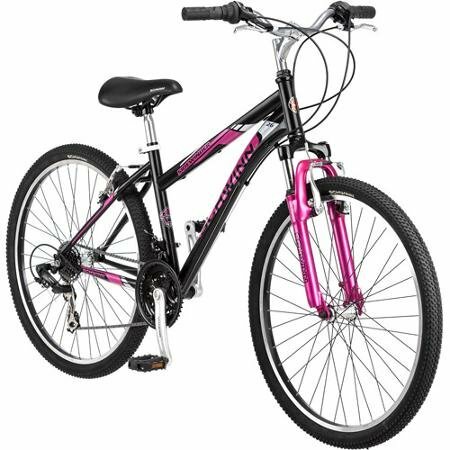 Ladies can enjoy a pleasant ride anywhere with the impressive Schwinn Sidewinder 26″ women’s mountain bike. The bike is easy to control thanks to the Suntour Suspension fork. It has a gearing of up to 21 speeds which will offer you the best ride possible. This bike also has a fork-SR Suntour suspension fork. This fork provides a controlled and safer riding. It also has a saddle that is adjustable. The Schwinn Sidewinder has a quick release saddle to allow ease of adjustment. This is ideal for exercise since adjusting the seat can actually ensure that you get to exercise different muscle groups given the different positions of the saddle. You can therefore easily adjust the bike to a height that you are comfortable with It is easy to stop the bike while in motion. This is because the bike has an alloy linear pull brakes. It has alloy rims which are strong and also the handlebars of the bike are light. The bike is designed with steel mountain bike pedals so you can be assured of the durability of the bike. It is an ideal bike to ride on the rough or uneven terrain. This gives you a chance to ride even in the dark. It is fitted with a bottle water mount where you can keep your bottle of water or juice to keep you hydrated during hot weather. This bike looks simplistic but it sure stands it position well against other bikes in its category. There is everything to enjoy including a dual suspension system, great looks and durable components that make up the bike. The bike features a foldable frame. This comes as a relief to many for many reasons. For starters, the space-saving capacity of this foldable bike brings convenience because space is priceless whether at home, your personal vehicle or public transport. You can store or carry the mountain bike in a limited space. It has a 26″ suspension fork made of steel that increases stability and makes the bike easier to control. It is a lightweight bike weighing about 38.5Ibs. It also has ample gears of up to 18 speed and also durable Wanda tires. It shifts seamlessly well and swiftly through the gears. Stowabike is capable of doing through different biking terrains making it among the best bikes. Its rims are made of single wall alloy which will ensure that the bike lasts longer. It can withstand up to 140kg so it is a comfortable bike to ride in for all persons. It can be purchased with other items such as LED lights which when fixed, you can enjoy riding the bike at night. It is also fitted with water bottle mounts and a pouch where you can keep your stuff when riding this bike. This should be a darling of the ladies. 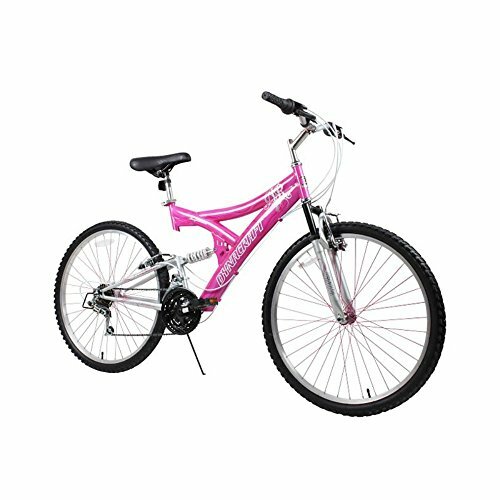 With a pink body and tire spokes to match the 26″ mountain bike guarantees an exciting ride while looking good. This model is made of steel which is pink and white in color. The bike has a linear brake style makes it have a powerful stop. It has rear and front v-brakes. The bike has 21-speed index with Shimano grip shifters that will make you ride swiftly and more comfortable. The bike weighs about 43.12 pounds making it not heavy to ride. Riding on this bike will make your rides exciting and there is no doubt you will have a blast. Ladies can hit trails of whatever terrain at their comfort thanks to dual suspension mechanisms that absorb shock and give good control of the machine. There are 21 speeds to enjoy from the hovering mountain bike saddle thanks to the mid-frame spring shock. The saddle is also a quick-release affair that allows for ease in adjusting the saddle height. All said the different components are easy to put together. The main structure of the bike provides a stable, and durable foundation for great performance. The hard-tail steel frame of this bike prevents damage to the bike for years. The safety of the rider is also assured because of the added stability. The 75mm fork takes away the bite and shocks that come when on a rough terrain providing a comfortable ride. The bike can support up to 300 pounds of weight and comes in three frame sizes; 17, 19 and 21 different suiting riders. The 29-inch wheels offer much driving comfort and stability than smaller wheels. They have a lower striking angle when you hit obstacles allowing for a smooth rollover. The large wheels cover large distances faster compared to small wheels. They also provide a stable way to control forward momentum when riding downhill. The Shimano components used on the drivetrains add much quality to the reliability of performance both on flat and inclined surfaces. Maintenance of the bike is comfortable because each part can be taken apart. The only shortcoming of the bike is its overall weight which is a result of the steel construction. The accompanying manual does not provide sufficient assembly instructions. It is clear that being on a budget doesn’t really mean you don’t get to enjoy the conveniences and adventures of having a mountain bike. The design of these bikes is classically made, making it easy to ride using one of these bikes. Also, the bikes are durable enough as they are made of steel or aluminum which is a durable material. 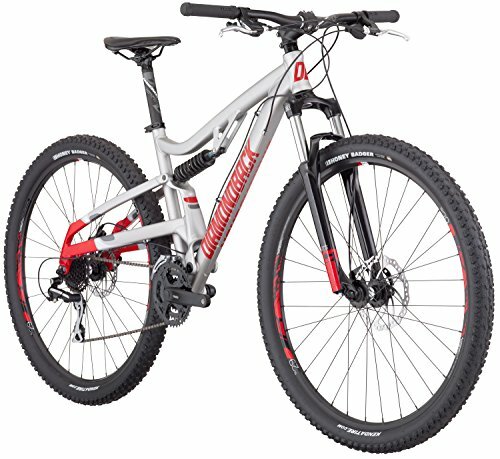 The mountain bikes are also ideal for riding on different types of terrain and you will be very comfortable riding on one of them. Do not hesitate to purchase or order yours today.